The Qianlong emperor, like his predecessors Emperors Kangxi and Yongzheng, was a devout follower of Tibetan Buddhism, commissioning the building of numerous temples and the production of a wide range of ritual vessels for tribute and ceremonial use. This ewer was one such sacrificial utensil. Geng Baochang illustrates a line drawing of this type of ewer in Ming Qing Ciqi Jianding, 1993, p. 266, pl. 454, no. 9, and states that, as recorded in the Tai'an Gazetteer, these benpa hu or Tibetan vases, also known as zangcao ping, 'herbal storage jar', were used in the ceremonies carried out at the Taishan mountain temple in Shandong province from the Qianlong period onwards. No other ewer of this exact design has been recorded. This type of vessel is also known as a 'pure water ewer', and other similar examples in this form but with different decoration are known, such as the famille rose enamelled example from the Victoria and Albert Museum, illustrated by Rose Kerr, Chinese Ceramics, Porcelain of the Qing Dynasty 1644-1911, London, 1986, pl. 101, where the author suggests that "it was used on a Buddhist altar of the Tibetan-inspired Lamaist sect which delighted in exotic monster decorations and beaded borders. ", p. 114. It is also suggested that the shape of the present vessel was derived from pewter, as a benpa vase decorated to simulate pewter is also in the Victoria and Albert Museum, and illustrated op. cit., pl. 59. 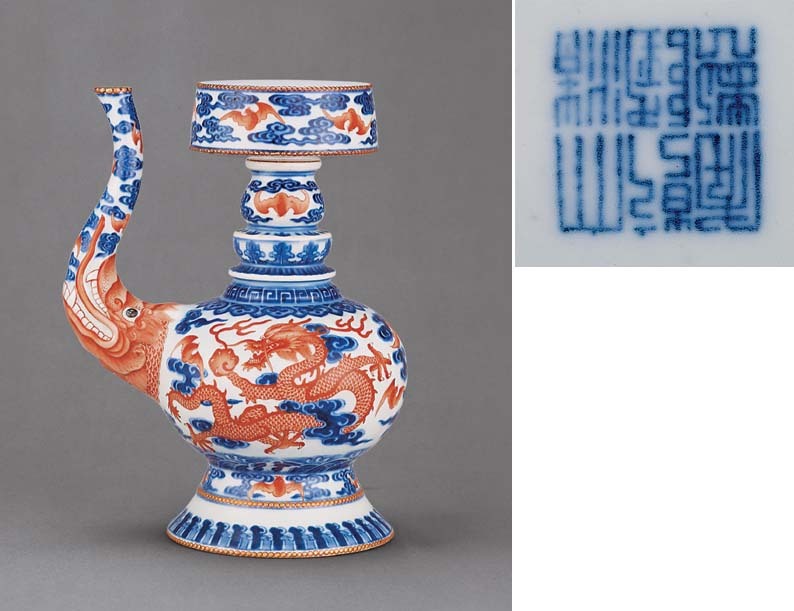 Compare the silver benpa ewer of related form in the Palace Museum, Beijing, illustrated in Gugong Bowuguan Cang Gongyiping Xuan, 1974, pl. 96; and another silver benpa vase illustrated in Cultural Relics of Tibetan Buddhism Collected in the Qing Palace, pl. 146, where the author mentions that these vessels were originally used in Tibet for displaying sprays of herbs and placed in front of images of Buddha.